A knife sharpener is an essential tool in every kitchen. But when it comes to buying the best knife sharpener, do not assume the pricier one is always the best nor the cheapest will not last. It all depends on your needs and with a little help to find the right sharpener, it really makes your purchase a worthy buy. It may not be the best knife sharpener in the world but it helps to restore your dull kitchen knives anytime you need it. In fact, a lot of consumers are trying to find the best product but not knowing what criteria makes up the best. Do I need a 2-stage or 3-stage sharpener? What angle edge – 15 or 20-degree? By answering these questions, you’re on the way to choosing the best knife sharpener within your budget. Next, a quick buyer research is the least you must do. You just need 30 minutes to an hour to read the customer reviews on Amazon, Walwart, manufacturer’s websites, forums, review sites on personal blog, and watch some Youtube product review videos. This will give you an idea of the best model to fit your budget. Trust me. 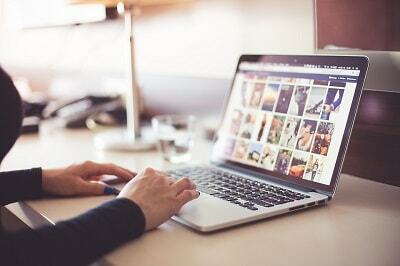 The one hour spent on reading product reviews will provide some insight guides and tips on getting the right model. By the way, have you shortlisted any kitchen knife sharpener for your sharpening needs? Whether you’ve a preferred sharpener or not, we’d recommend you to watch the video review on how America’s Test Kitchen conducted a test on different brands of manual and electric knife sharpeners and the final selection of the best model they chose (video at the end of this post). On top of that, we’ve also summarized the video below and even input our opinions regarding the selection of the best sharpener. If you like, please read on. Who is America’s Test Kitchen? There are many brands of electric sharpeners on the market. In this article, we’ll see why America’s Test Kitchen (ATK) chose Chef’s Choice 15 Trizor XV as the best electric knife sharpener. America’s Test Kitchen is a culinary media company with over 200 employees, specializes in producing short cooking television shows distributed in the United States and Canada. It also produces cooking recipe magazine, Cook’s Illustrated, supported by paid subscribers. Firstly, the team in ATK bought a bunch of Victorinex Fibrox Pro 8-inch chef’s knives for the test. The Victorinex chef’s knife is a preferred choice, as the 15-degree super narrow cutting edge is razor-sharp as compared to wider angle edges. Apparently, it’s more suitable for such test to see and feel the differences of the sharpness after sharpened when doing a cutting and slicing test. Traditionally, European and American style knives were sharpened to 20-degree or even wider angles which make it less surgically precise. Knowing its disadvantage, European knife manufacturers (Wusthof, Henckels, MesserMeister, and Mercer) have since switched over to 15-degree edge as market demand is already on the rise. ATK selected a total of 9 sharpeners including 5 manual and 4 electric ones which cost anywhere from $20 to $200. The team in America’s Test Kitchen first dull all the 9 new Victorinex chef’s knives using their own methods and then sharpened them through each of the sharpener. The results were then tested on slicing copy papers and dozens of ripe tomatoes. There were mixed results. Some knives couldn’t cut properly and some knives were as good as new or better. Through this test, ATK concluded two factors should more or less determined the sharpening quality. Firstly, it’s the abrasive that sharpens the blade. There are three abrasives commonly used for sharpening knives – carbides, ceramic and diamonds. Of all the three types, diamonds are by far the most effective and durable abrasive to use for sharpener because it’s the hardest material in the world. The second important factor is the design of the sharpening chamber, which is the angle guides. When you pull a knife in the slot, the sharpener must control the movement of the knife steadily during the sharpening process. A good sharpener will ensure the knife a steady movement, leaving no room to wriggle as it passes through the slot. After the test, those sharpened knives were then observed under a high-powered microscope. The blades that bounded around in the slot were utterly ragged. The best ones have a nice and smooth edge. Obviously, it could glide through tomatoes effortlessly. The winner was Chef’s Choice 15 Trizor XV. It has all the factors that make it the best one out of 9 sharpeners. The diamond abrasives and the super clever spring-loaded guides attributed to a smooth and razor-sharp blade. There’s no way to make a mistake. The sharpened blade was then tested against a new Victorinex chef’s knife. It could cut better than the new knife. The Chef’s Choice 15 Trizor XV was a real winner. An alternate model was also introduced in this test. It’s a 15-degree Diamond Hone sharpener for Asian knives. 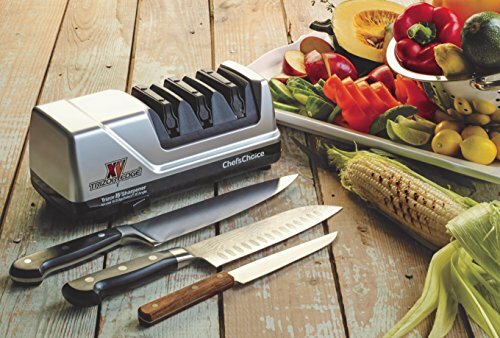 The Chef’s Choice 316 was a cheaper version of the Trizor XV and crowned as the best buy sharpener by ATK. However, the 316 is only a 2-stage sharpener as compared to the 3-stage Trizor XV. For a budget-conscious buyer, the 316 is also a good choice in terms of performance to price ratio. Of course, this model only comes with 1-year warranty instead of the 3-year for the Trizor XV. In fact, in our opinion, there is also a cheaper replacement model for the Trizor XV that also delivers great results on15-degree Asian knives, too. The Chef’s Choice 315 XV is also a 2-stage sharpener. If you compared the warranty period, the 2-year warranty is a blessing as opposed to only 1-year for the Chef’s Choice 316. Not to mention the advantages of having the flexible stropping disks in stage 2 similar to the Trizor XV. In case you do not know the advantages of strops, it effectively removes burrs from sharpeninging and improve the edge sharpness. This kind of sharpness can slice a falling hair, not to mention using it for cutting food. For a budget-friendly model to replace the critically-acclaimed 3-Stage Trizor XV, the 315 XV is a good bet. Repair Serious Damaged Blades – Manual or Electric Sharpener? In this comprehensive knife sharpener test including 5 manual and 4 electric models, it was proven only the electric sharpeners could repair seriously damaged blades. The manual ones are only good for regular touch-ups. In our opinion, the motor is another main key factor to winning the test (other than the 2 factors above mentioned by ATK) although some manual sharpeners have diamond abrasives, too. In comparison to steel grinding between the electric and manual models, it’s very obvious more steel are being removed by the electric ones. The high performance grinding power of the motor does a faster and better job than the non-electric models, hence sharper blades. What Makes The Best Knife Sharpener? In summary, the following criteria were the attribution to the winning of this test. Of all the different brands of sharpeners, Chef’s Choice has all of the above. 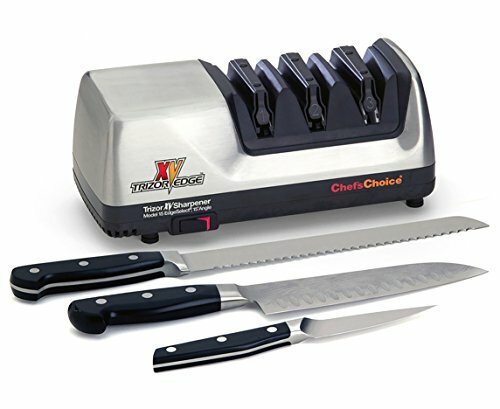 ATK also recommended the manual sharpener from Chef’s Choice. The Chef’s Choice Pronto 463 Manual Diamond Hone Asian Knife Sharpener is the best handheld manual sharpener besides the electric ones. This 2-stage manual knife sharpener has been in the market long enough to gain enough trust from the consumers. Having achieved good reviews from the quality and design, it’s still selling fast on Amazon. If you prefer a high-quality 2-stage manual sharpener, you won’t be disappointed. From this review done by America’s Test Kitchen, three models from Chef’s Choice are worth to consider. Well, we’d say it’s not fair that only Chef’s Choice scored high in this review. ATK did not mention what other brands they had included in the test. We guess that this review did not include all the brands in the 15-degree sharpening range. We’re very sure the Work Sharp Ken Onion Edition is not included in this test. We may be wrong, but it’s just our personal opinion. All in all, we really appreciated what ATK had done to attest the quality of Chef’s Choice sharpeners. It helps consumers come closer to choosing the best knife sharpener in the market. You may want to know how America’s Test Kitchen did the sharpener test, watch the video below.